The holiday season for me, is all about gathering my family together. It’s our time to chat, relax, play games, sleep, eat, drink and just be merry. In this age of constant to-do lists, work schedules and obligations, it is so refreshing to just stuff that all on a shelf, and simply put our feet up for a few days. Our children are getting older and their families are growing in leaps and bounds. Two lovely baby girls were born in 2016, Annaleigh (SweetPea) & Paisley (Daisy), plus we inherited two adorable boys who are Paisley’s brothers (Beet & Bean) which increased Brusselsprout’s (Charles) kinfolk. With all these little ones in our lives holidays are now extra special. 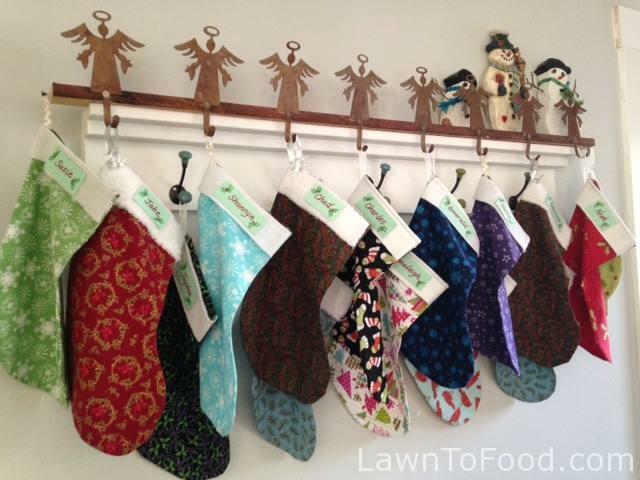 I’ve been doing food preparations and decorations for a few weeks now, to lessen my last minute load. 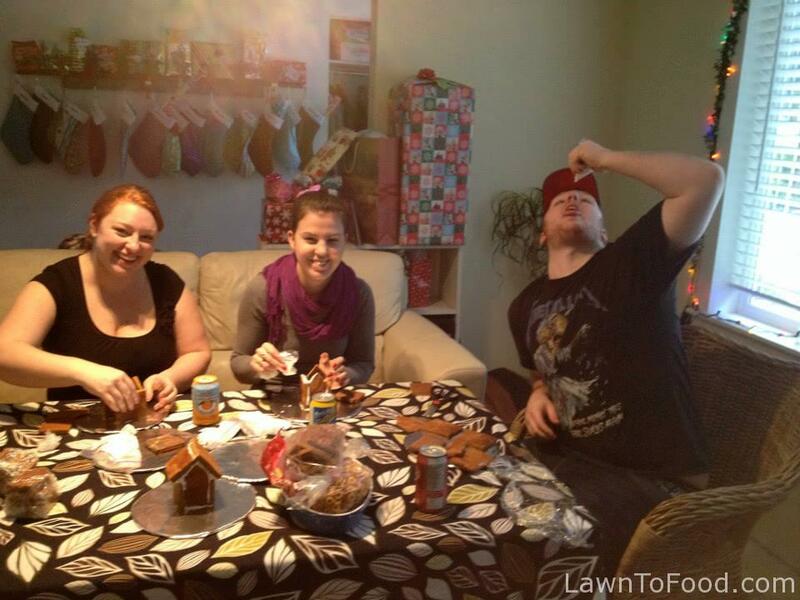 Building and decorating Gingerbread houses is a time honoured tradition in our household. Over the years, I have developed a simple method to make small houses so that almost everyone can create their own. I’d like to pass that on to you today. 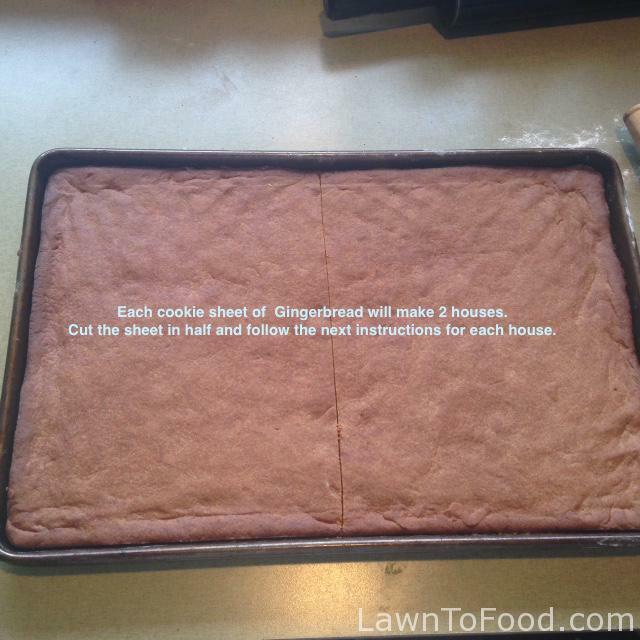 Mix up a batch of your favorite Gingerbread and then finger press a 1/4 inch layer of batter on a greased cookiesheet. This is my recipe. Mix until well combined. Roll into balls, dip one side in sugar for ginger snaps. 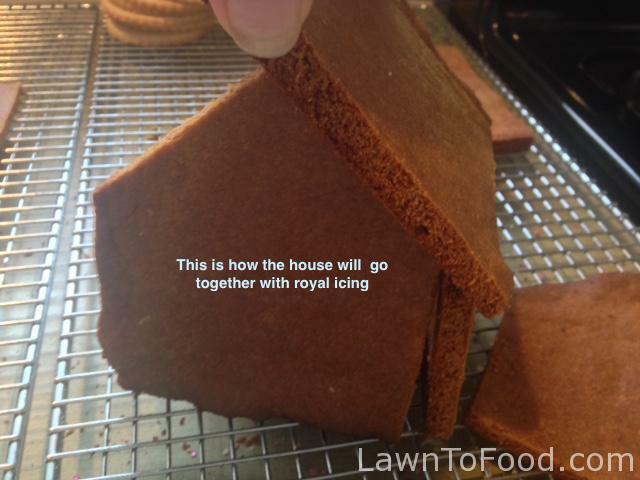 Refrigerate for 30 minutes and then roll for gingerbread people or for houses 🏡 Bake ar 350F until edges start to turn brown. 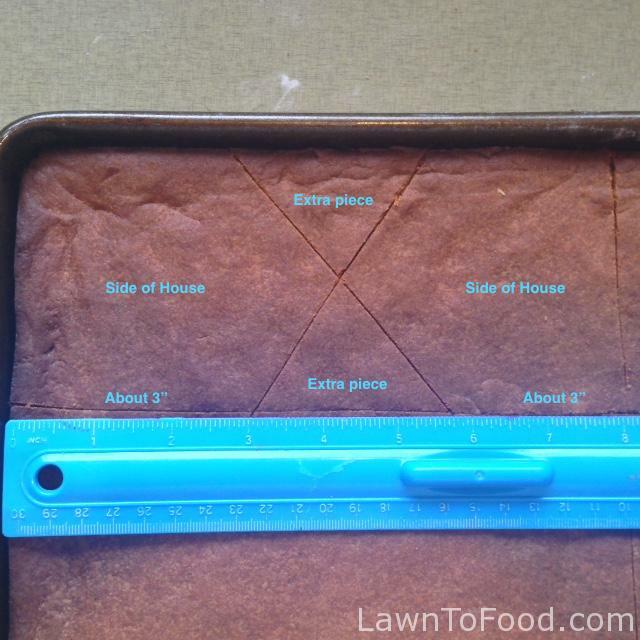 Below is a picture of half of the cookie sheet that I divided above. 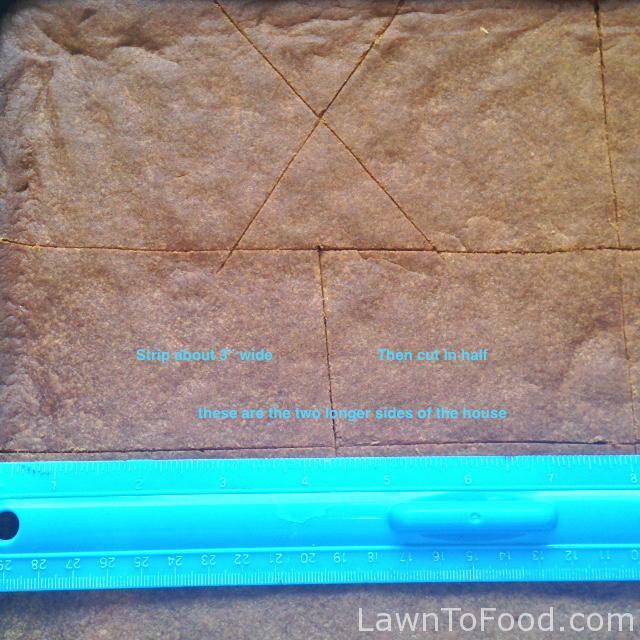 This half of the cookiesheet is going to be cut into three horizontal sections. The top section will be the gable end of one house (pictured above), the middle section (below) is the sides the house. The third and lower section is the roof of the house. Here is one house cooling on the rack. The top pieces are the roof, then the two sides and at the bottom are the two gable ends of the house. 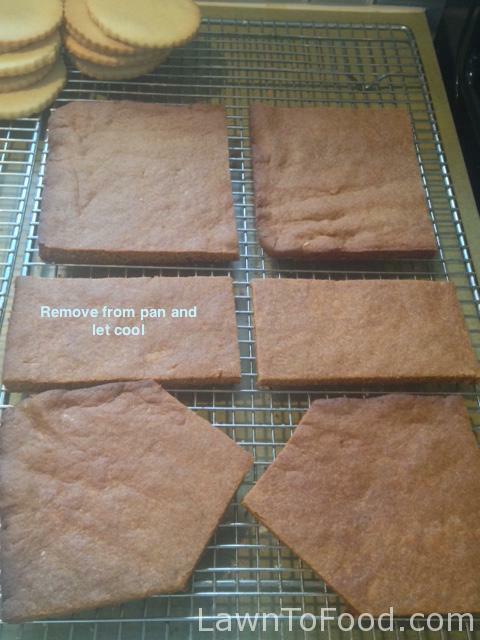 I repeated the cutting procedures with the second half of the cookie sheet gingerbread. 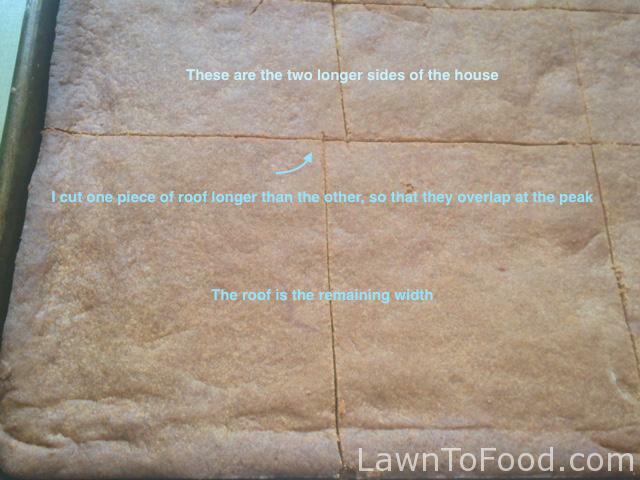 This entry was posted in Let's Eat by Lynda. Bookmark the permalink.